the amygdala, in young women . difference in the prevalence of eating di sorders. was associated with substantial body dissatisfaction. not show greater activation in any region. Sachdev et al. women from a different cultural background. dents (32 females), with a mean age of 20.5 years (S.D. tem, by which a central hole was coordinated with Fz. tral/rostral to the left lateral (to refer the video content). task 5 sec, and post-task 5 sec). of samples for the 2 periods was not equal. (grading to yellow, green, and opposite in deeper blue). <Video content can be viewed on http://www.youtube. Degree of freedom = 24, *; p < 0. 0 5 , rest vs. task. Degree of freedom = 24, *; p < 0.05, rest vs. t ask. eral (to refer the video content). in males (p < 0.01). Table 3. 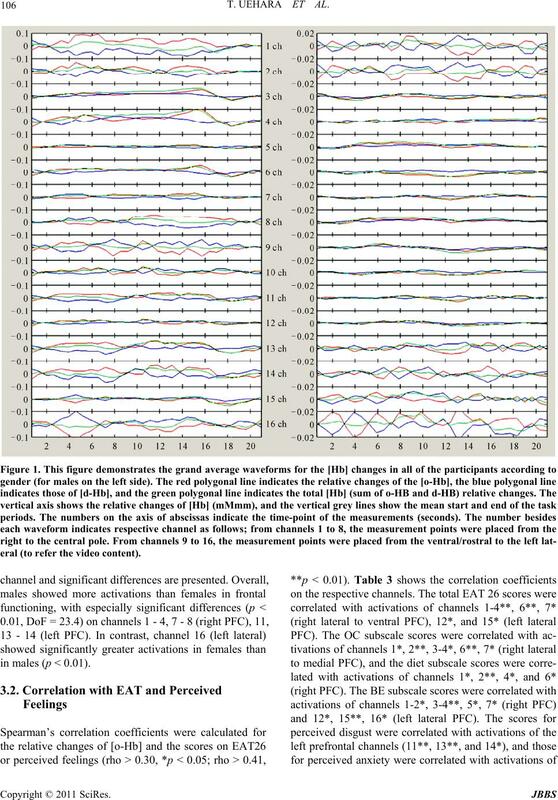 Correlations between perceived feelings or EAT and NIRS activations. 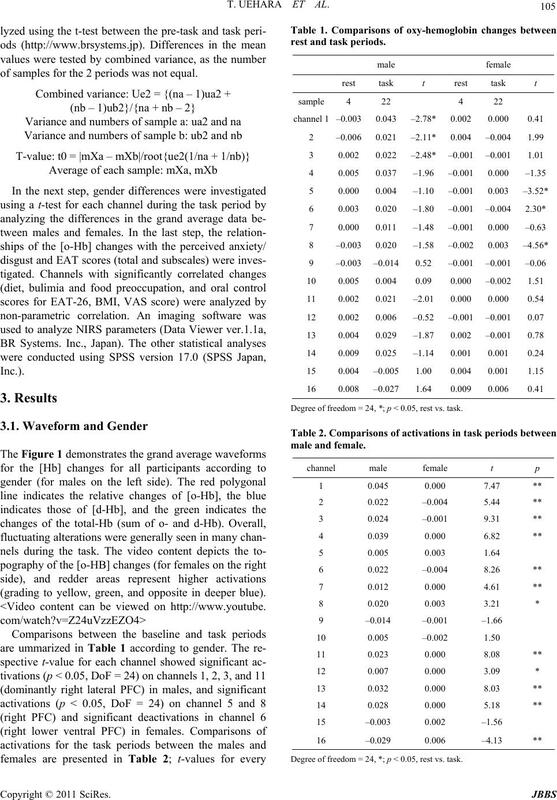 Spearman’s correlation coefficients, **; p < 0.05, *; p < 0.05 ch: channel. rior frontal pole (BA9) . male forms to be pathologically thin. lated to gender-specific emotional status and processing. oped recently to improve placement and detection . The other limitations of this study should be noticed. for people in alternative areas. ing the thin body forms of others. R. Uher, T. Murphy, H. C. Friederich, T. Dalgleish, M. J.
chiatry, Vol. 58, No. 12, 2005, pp. 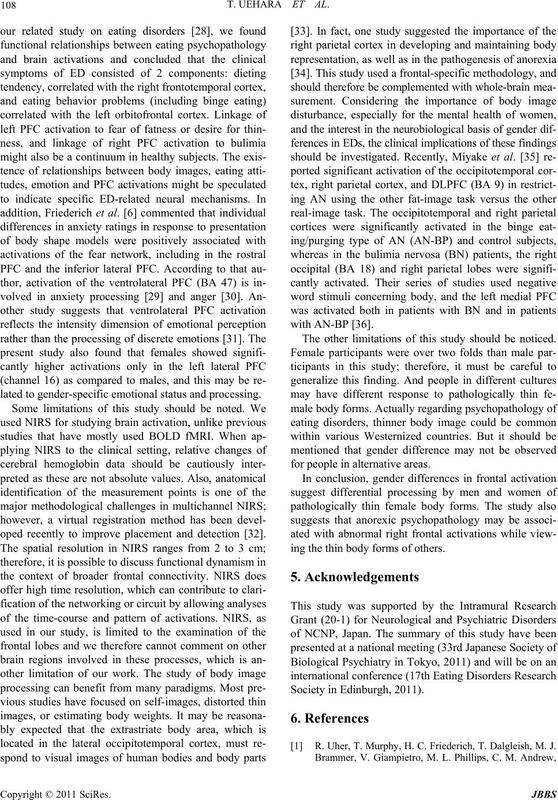 990-997.
in Anorexia Nervosa,” NeuroReport, Vol. 14, 2003, pp. 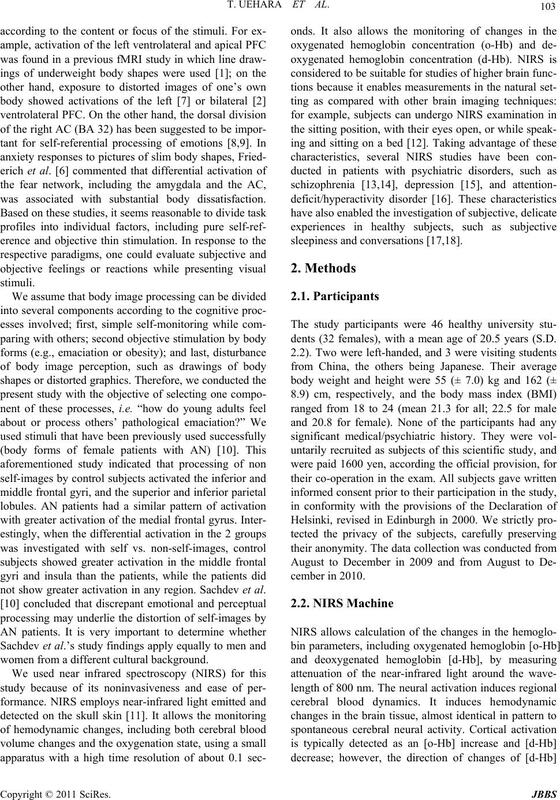 N. Shirao, Y. Okamoto, T. Mantani, Y. Okamoto and S.
age: An fMRI Study,” British Journal of Psychiatry, Vol. H. M. Mohr, J. Zimmermann, C. Röder, C. Lenz, G.
Psychological Medicine, Vol. 40, 2010, pp. 1519-1529. H. C. Friederich, R. Uher, S. Brooks, V. Giampietro, M.
Brammer, S. C. Williams, W. Herzog, J. Treasure and I. Image, Vol. 37, No. 2, 2007, pp. 674-681. No. 4, 2006, pp. 380-386. P. Fossati, S. J. Hevenor, S. J. Graham, C. Grady, M. L.
Vol. 160, No. 11, 2003, pp. 1938-1945. K. N. Ochsner, K. Knierim, D. H. Ludlow, J. Hanelin, T.
eropsyhologia, Vol. 46, 2008, pp. 2161-2168. Neuroimage, Vol. 23, Supplement 1, 2004, pp. 275-288. M. Suda, M. Fukuda, T. Sato, S. Iwata, M. Song, M.
Ventrolateral Prefrontal Cortex,” Brain Research, Vol. 1252, Supplement 1, 2009, pp. 152-160. Behavior Neurology, Vol. 21, No. 1, 2008, pp. 41-45.
nia Research, Vol. 99, 2008, pp. 250-262. 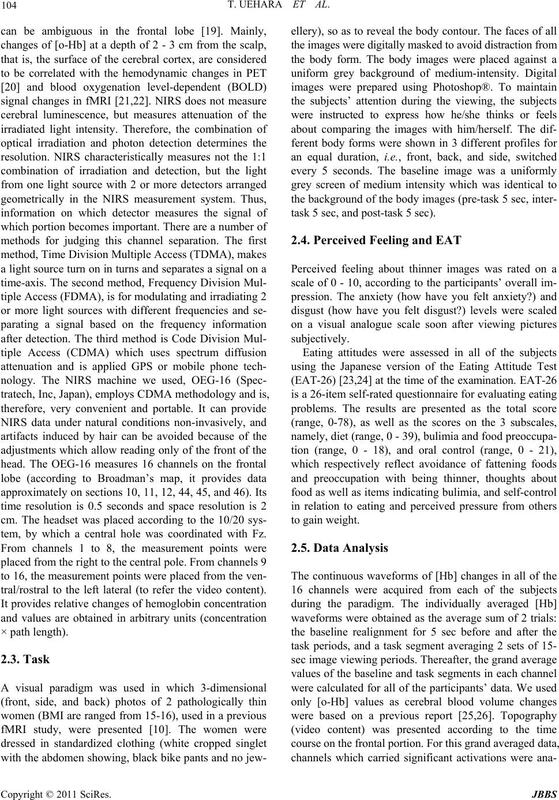 Functional Near-Infrare d Spectroscopy,” Neuroimage, Vol. 26, No. 1, 2005, pp. 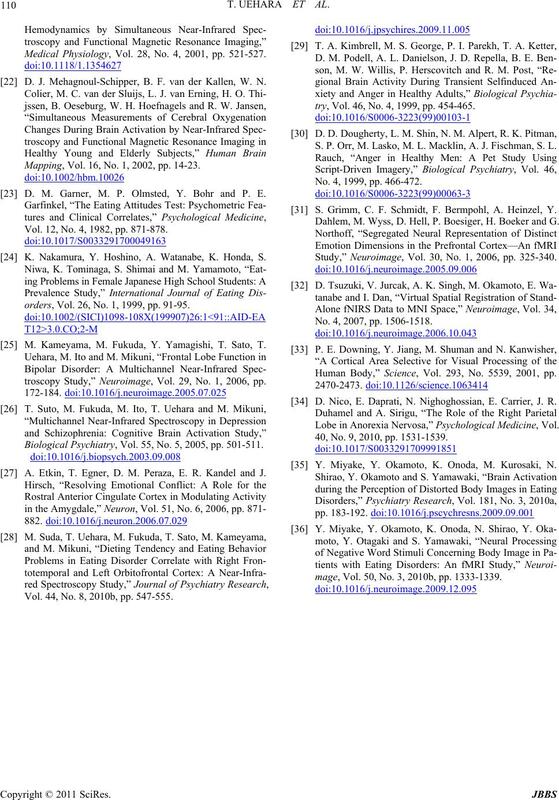 234-242.
nal of Psychiatric Research, Vol. 42, No. 3, 2008, pp. M. Suda, Y. Takei, Y. Aoyama, K. Narita, T. Sato, M.
No. 2, 2010a, pp. 441-447. M. Suda, T. Sato, M. Kameyama, M. Ito, T. Suto, Y.
search, Vol. 60, No. 3, 2008, pp. 319-326. T. Sato, M. Ito, T. Suto, M. Kameyama, M. Suda, Y.
Yamagishi, A. Ohshima, T. Uehara, M. Fukuda and M.
search, Vol. 58, No. 3, 2007, pp. 297-304. E. Ohmae, Y. Ouchi, M. Oda, T. Suzuki, S. Nobesawa, T.
Medical Physiology, Vol. 28, No. 4, 2001, pp. 521-527. D. J. Mehagnoul-Schipper, B. F. van der Kallen, W. N.
Mapping, Vol. 16, No. 1, 2002, pp. 14-23. D. M. Garner, M. P. Olmsted, Y. Bohr and P. E.
Vol. 12, No. 4, 1982, pp. 871-878. K. Nakamura, Y. Hoshino, A. Watanabe, K. Honda, S.
orders, Vol. 26, No. 1, 1999, pp. 91-95. 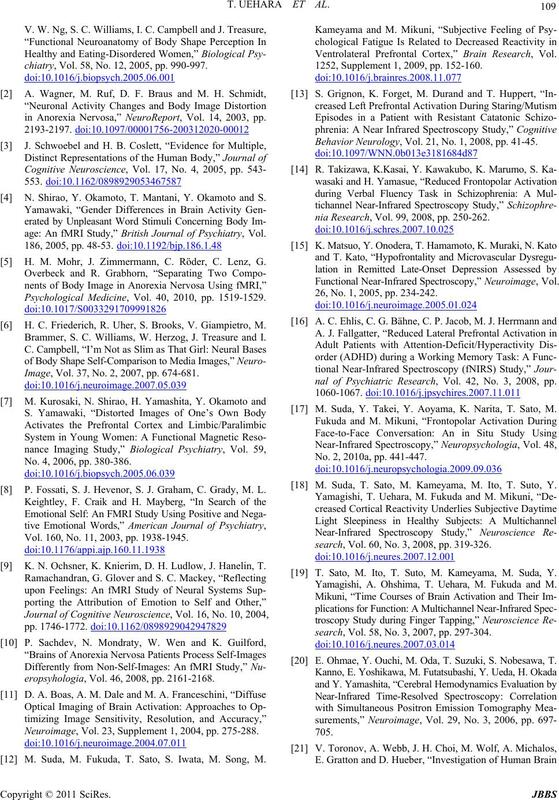 M. Kameyama, M. Fukuda, Y. Yamagishi, T. Sato, T.
troscopy Study,” Neuroimage, Vol. 29, No. 1, 2006, pp. Biological Psychiatry, Vol. 55, No. 5, 2005, pp. 501-511. A. Etkin, T. Egner, D. M. Peraza, E. R. Kandel and J.
Vol. 44, No. 8, 2010b, pp. 547-555.
try, Vol. 46, No. 4, 1999, pp. 454-465. S. P. Orr, M. Lasko, M. L. Ma cklin, A. J. Fischman, S. L.
No. 4, 1999, pp. 466-472. S. Grimm, C. F. Schmidt, F. Bermpohl, A. Heinzel, Y.
Dahlem, M. Wyss, D. Hell, P. Boesiger, H. Boeker and G.
Study,” Neuroimage, Vol. 30, No. 1, 2006, pp. 325-340. No. 4, 2007, pp. 1506-1518. Human Body,” Science, Vol. 293, No. 5539, 2001, pp. 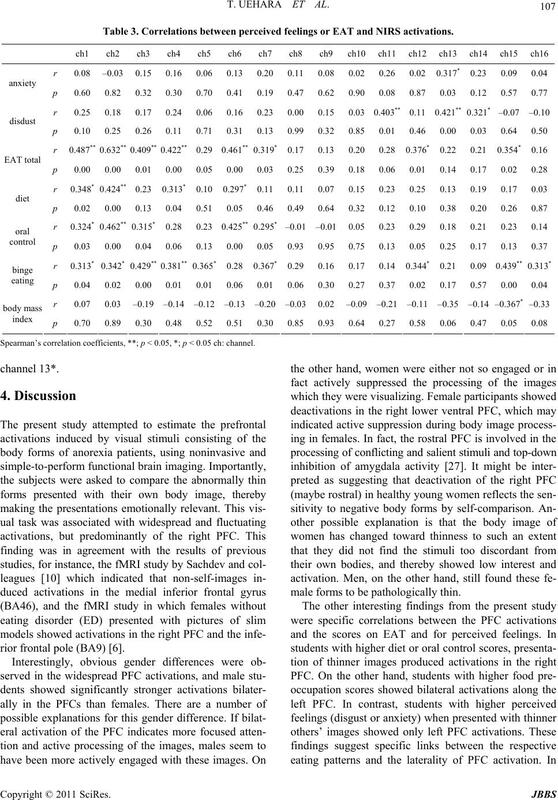 D. Nico, E. Daprati, N. Nighoghossian, E. Carrier, J. R.
Lobe in Anorexia Nervosa,” Psychological Medicine, Vol. 40, No. 9, 2010, pp. 1531-1539. Y. Miyake, Y. Okamoto, K. Onoda, M. Kurosaki, N.
mage, Vol. 50, No. 3, 2010b, pp. 1333-1339.